A parliamentary report of 1777 recorded local workhouses in operation in Caldbeck (for up to 80 inmates) and Hayton (7 inmates). According to an 1829 directory, Wigton had a parish workhouse on Old Lane. In the same year, the Caldbeck parish workhouse, located at Hesket new Market, had an average of three inmates. The township of Oulton erected a workhouse in 1828 at a cost of £400. Cumberland: Abbey Quarter (2), Aikton, Allhallows, Allonby and West Newton (2), Aspatria, Baldwinholme, Blencogo, Blennerhasset with Kirkland, Bolton—High Side, Bolton—Low Side (2), Bowness (2), Broomfield, Caldbeck (2), Dundraw, Hayton and Melo, Holme Cultram—East Waver Quarter, Holme Cultram—St Cuthbert Quarter, Holme—Low Quarter (2), High and Low Ireby, Kirkbride, Lanrigg and Meabrigg, Oulton Quarter, Sebergham—High and Low Quarter (2), Thursby, Torpenhaw and Whitrigg, Uldale, West Ward (2), Waverton—High and Low, Wigton (4), Woodside Quarter. The population falling within the union at the 1831 census had been 22,223 with parishes and townships ranging in size from Allhallows (population 205) to Wigton itself (4,885). The average annual poor-rate expenditure for the period 1834-36 had been £5,182 or 4s.8d. per head of the population. Initially, the new union made use of the existing parish workhouses at Caldbeck, Oulton, Glasson and in Wigton itself at The Bog. A new Wigton Union workhouse was built in 1838-42 on an eleven-acre site on Cross Lane which had been purchased for £323.16s.8d. In 1838, the Poor Law Commissioners authorized an expenditure of £4,720 on the scheme which was to accommodate 250 inmates. The building, which was completed in 1842, has a very similar plan to the nearby Penrith and CockermouthUnion workhouses; all are broadly based on Sampson Kempthorne's 200-pauper model plan published by the Poor Law Commissioners in 1836. The Wigton site's location and layout can be seen on the 1900 OS map below. The building consisted of a two-storey main block connected at its centre to a U-shaped main building at the rear. Wigton front block from the south-east, 2001. Wigton front and main blocks from the south, 2001. A detached single-storey block running across the rear contained the kitchen and dining-hall. Wigton kitchen/dining-hall and rear of main building from the north-east, 2001. The detached workhouse infirmary was located the north of the site. 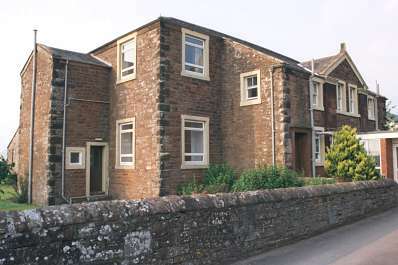 Wigton infirmary block from the south-west, 2001. The workhouse later became Highfield House Public Assistance Institution and then under the National Health Service as Wigton Hospital which still occupies the site. 1838 - Master: James Hodgson. Carlisle Archive Centre, Lady Gillford's House, Petteril Bank Road, Carlisle CA1 3AJ. Holdings: Guardians' minutes (1925-30); Vagrants' relief book (1879-1880).